The slide is taken from a discussion document (pdf) containing “pertinent information, arguments, and data about the current debate over open access (OA)” for the proposed US Federal Research Public Access Act of 2009. 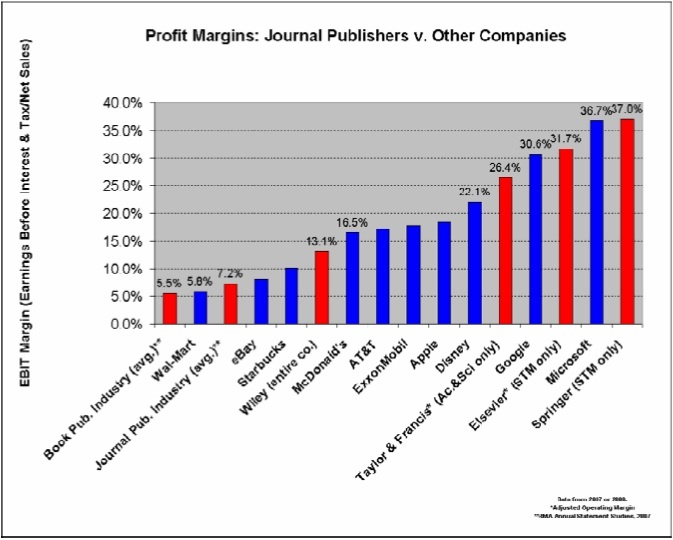 The document contains a second and perhaps more shocking diagramme comparing the profits made by academic publishers to other industries. 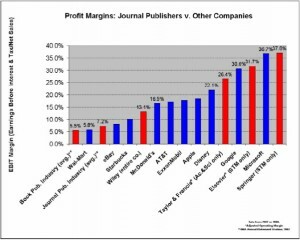 I suspect, though, that such inflated profits are confined to the large global academic publishers. Whilst in New York, I talked to Michael who works for a relatively small publisher in the city. He gave me the impression they were certainly not raking in so much money! His main current work was focused on providing e-book versions of older manuscripts and publications which are now out of press. He felt there was much valuable knowledge which was presently lost to the system because of the nonavailability of older print based publications and saw the possibilities of cheaper e-book publishing as opening great possibilities to bring this knowledge back to life. He was not concerned about the possibilities of e-publications being pirated, arguing instead that if every 100 pirate editions brought one sale, then that was good for the publishers and of course good for learning and knowledge sharing. In this regard I wonder if there is the basis for some kind of alliance between the Open Access movement and the smaller academic publishers. Has Open and Linked Data failed? I am intrigued by this presentation. Whilst I appreciate what Chris Taggart, who has been invo0lved in the development of the opencorporates and openlylocal data sites (and who undoubtedly has more experience and knowledge than me of the use of Open and Linked Data) I would be less pessimistic. 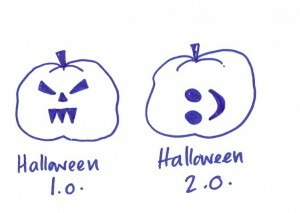 I see the use of open and linked data as in very early days. Firstly, although I appreciate that politicians and bureaucrats do not always want to release data – I think there is still a groundswell in favour of making data available – at least in Europe. Witness yesterdays unveiling of the Italian Open data store (sorry, I can’t find the url at the moment). And although Google search results do not help promote open data sites (and I am not a great fan of Google at the moment after they wiped out my account ten days again), they have contributed very useful tools such as Refine, Fusion Tables and Public Data Explorer. I still think that as Chris Taggart says in one of his first slides the biggest challenge is relevance. And here I wonder if one of the problems is that Open and Linked Data specialists are just that – specialist developers in their own field. Many of the applications released so far on the UK Data store, whilst admiral examples of the art of development – would seem to have little practical use. Maybe it is only when the tools and knowledge of how to work with Open and Linked data are adopted by developers and others in wonder social and subject areas that the true benefits will begin to show. Open data applications may work best, not through dedicated apps or sites, but when incorporated in other web sites which provide them with context and relevance. Thus we have been working with the use of open and linked data for careers guidance (see our new web site, www.careerstalk.org which includes working demonstrations). Bu even more important may be finding ways of combining Open and Linked data with other forms of (human) knowledge and intelligence. It is just this form of knowledge – for instance the experiences and informal knowledge of careers guidance professionals, which brings relevance and context to the data from official data sets. And that provides a new design challenge. Posted in Career Guidance, careers, Data, G8WAY, Knowledge development, Mature, open access, Open Data, Social Software, Wales Wide Web | Comments Off on Has Open and Linked Data failed? A Ministry of Justice report from the UK government confirms what we all suspected about the riots which took place in the summer in England. Despite the prime ministers rush to blame gangs and gang culture for the riots this was not a major factor. Those arrested would appear in general to be young people alienated from the education system and with little prospect of skilled work (or indeed in the present economic climate any work at all). Education policies designed to promote traditional subjects and attempts to strengthen school discipline are not going to help. Neither will the cutbacks in educational expenditure, which are having a disproportionate impact on vocation education and the near closure of many youth services. Posted in politics, Wales Wide Web | Comments Off on What caused the riots? The debate over the future of Higher Education is continuing. There were two interesting newspaper articles in the past days in the Guardian and the New York Times. The Guardian reports that the first set of statistics on applications to university next year, published by the Universities and Colleges and Admissions Service (Ucas), reveal that 52,321 applicants have applied from within the UK, compared with 59,413 this time last year. This is a fall of some 12 per cent, perhaps unsurprising given the steep rise in university tuition fees. But the main interest is in the detail. The fall in applications is by no means even across universities and subjects, or by geographical region or age of applicant. The Guardian reports: “The figures suggest more women than men have been put off from applying to university. Some 10.5% fewer women have applied this year, and 7% fewer men. There are some pretty clear patterns here. Although there is no data on socio econo0mic backgrounds of applicants the fall in applicants is greatest from working class areas. And in deterring mature students from applying, this will have a disproportionate effect on education which has in the past been an attractive second career. The reduction in applications for business studies is more puzzling. Once more this may be an effect of less applications from mature students. Or it could be a general disillusionment with business as a whole. Or it may be that students are turning towards more vocational degrees and fear business studies offers little chance of post university employment. It is also interesting to note that the fall in applications is uneven across institutions. The elite universities – like Oxford and Cambridge – are little affected with the biggest reductions seemingly hitting the old Polytechnics. Once more this can be seen as a class factor, with elite universities always having had a disproportionate number of applications from higher income social groups. All in all, the figures appear to co0nfirm those critics who pointed to the UK university system becoming more elitist, with working class students afraid of the high debt levels the new fees structure will result in. The New York Times published an “Opinion” article by Michael Ellsberg entitled “Will dropouts Save America”? Such employment routes used to be called apprenticeships. A revival of apprenticeship training could offer a high skills alternative to university education and provide the job adaptability skills need for succeeding in the highly unstable employment market today. But such apprenticeships cannot be left to employers alone. In the UK the government has taken to calling almost any course an apprenticeship, regardless of skills levels or length. Apprenticeship requires development and regulations to ensure the quality of the learning experience. Bit apprenticeship can offer an alternati9ve route of education to the failed model of mass university education. I was in New York last Friday presenting at a panels session at the Mobility Shifts Conference on In, Against and beyond the Institution. The panel was chaired by Mike Neary and comprised of myself, Josie Fraser, Richard Hall and Joss Winn. Somewhat surprisingly to me some 15 people turned up despite it being scheduled at se4ven o’clock on a Friday evening. Joss presented the Student as Producer project which re-imagines students role in the design, development, and critique of the curriculum. The process of teaching learning is decoupled from traditional power relationships so students become an integral part of the governance of an institution rather than solely its customer (there is a paper available on this written by Joss together with Mike Neary. Richard considered how students and teachers might dissolve the symbolic power of the University into the actual, existing reality of protest, in order to engage with a process of transformation (for more see his blog). Josie talked about the transformative aspects of digital literacy. And I looked at changing pedagogies in work based learning and developmental competence – the capacity of the individual to acquire and demonstrate the capacity to act on a task and the wider work environment in order to adapt, act and shape (design) it. All good stuff. I found some of the ideas hard – and we certainly did not reach any conclusions. But the very fact that we are having such discussions – and the renewed interest in critical pedagogy – is testimony both of the crisis which pervades our univeristies and the growing opposition and questioning of the purpose and organisation of education including the role of researchers and teachers. To that extent I think the title – In, Against and Beyond – is helpful in linking the attempts to transform practices and roles within universities to growing protest movements outside the institutions – including the many initiatives – particularly in the UK – to explore alternative structures to the established universities. More on this when I am less tired. in the meantime Doug Belshaw has written a series of excellent blogs talking about some of the many wide ranging discussions which took place at Mobility Shifts. Yma o hyd….. yng Nghwpan y Byd. YMLAEN CYMRU! Pob lwc oddiwrth bawb ym Mhontydysgu. This vid has got absolutely nothing to do with the fact that WALES ARE NOW IN THE SEMI FINALS OF THE WORLD CUP (ac mae’r tim Saesneg wedi mynd adre). It is a learning object and I’m using it to illustrate an article I read today about a BBC Wales project, targeting ‘hard to reach’ teenagers, that used rugby as a vehicle for informal learning. 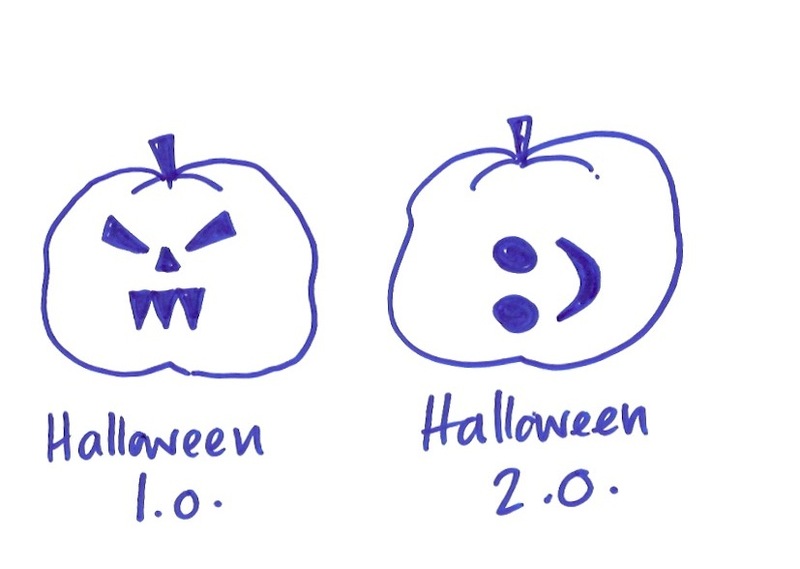 At a presentation at a recent conference in Budapest I indulged in a short rant about the tendency to put 2.0 after everything these days. the term – if it can be called that – has lost any meaning, I said. But I do like this doodle by Jenny Hughes that I just found on the floor of our office! The Italian language version of wikipedia has published the following open letter which we reproduce in full below. Comment seems unnecessary.